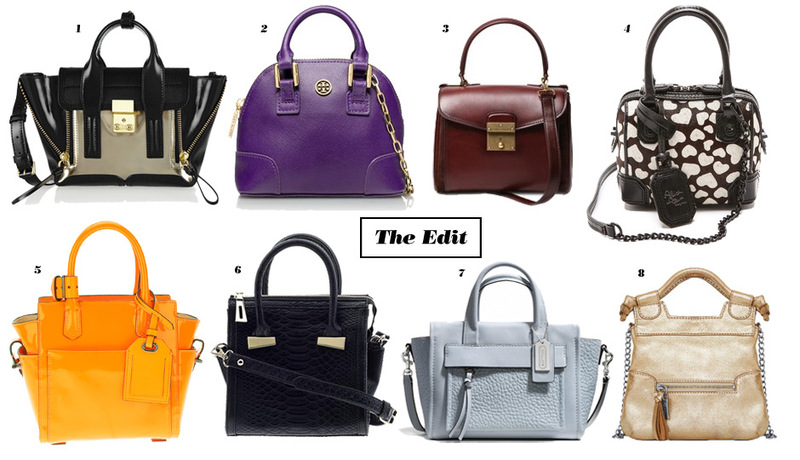 How designers are scaling down our favorite handbags—and why we're obsessed. By Marina Lamanna·	 1/15/2014, 3:29 p.m.
 3.1 Phillip Lim Pashli mini trapeze bag, $830 at Net-a-Porter. Robinson Shrunken Dome tote, $175 at Tory Burch. Mini Metropolitan bag, $1,595 at Marc Jacobs. Alice + Olivia mini Olivia bag, $295 at Shopbop. Reed Krakoff mini tote bag, $1,229.67 at Farfetch. Tinley Road Sydney mini satchel, $78 at Piperlime. Bleecker mini pocket carryall, $258 at Coach. Tiny City bag, $150 at Foley and Corinna.